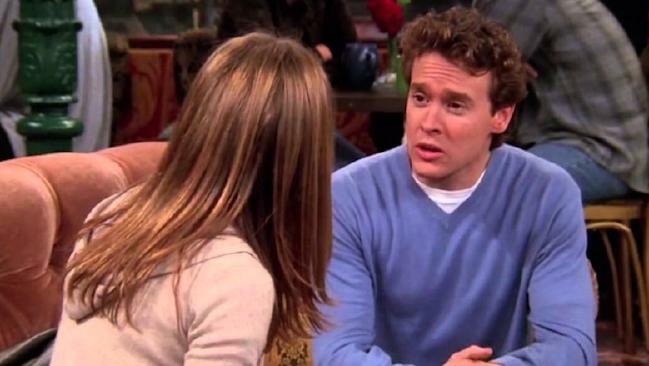 Tate Donovan has revealed how painful it was working with Jennifer Aniston on hit show Friends. JENNIFER Aniston's ex-boyfriend and former Friends co-star has opened up about how "tough" it was for the pair to work together on the show. Tate Donovan, 54, who played Rachel Green's (Aniston) boyfriend Joshua for six episodes in the late '90s told US Weekly how uncomfortable it was pretending to fall for the woman he had just broken up with in real life. "I was just happy to be on the team (of Friends). The only bummer was Jennifer and I were breaking up at the time," he told the publication. "And so that was tricky to sort of act, and act like we are just meeting each other, and falling in love, or whatever, interested in each other, when we're sort of breaking up … That was just tough." Aniston and Donovan had dated for two years, splitting up right before Donovan was due to film his first guest episode on the series. Because of the tricky personal situation, his character Joshua didn't last very long. Fans may remember that Rachel developed a huge crush on Joshua after meeting him at Bloomingdale's, where she was working as a personal shopper. But when her ex-boyfriend Ross (David Schwimmer) became engaged after a whirlwind romance with a British woman, Emily (Helen Baxendale), Rachel scared Joshua off by suggesting they also get married. Rachel suggested they get married after they’d only been dating for a few weeks. "It was just six episodes. I mean, only because we were breaking up. We were like: 'Hey, can we not keep doing this? Cause this is really painful and tough'," Donovan remembered. "The people that know that we dated think that we met on Friends. But in fact we had dated for two years before then, and it was over by the time we were on Friends together." Despite the awkwardness with his ex-girlfriend, Donovan praised the whole cast for welcoming him into the fold. "Those six people were amazing to me. They were fantastic. It wasn't cliquey for me at all. I was lucky," he said. "The good thing that came out of it was that everyone was really cool about it, and really as helpful as they could be … In other words, they were just compassionate, very compassionate about the whole breakup." The actor believed that the rest of the cast was impressed that he was able to get on with the job, given the painful circumstances. "It was sort of like I proved that, hey, I guess I'm a pro. If you can go through a tough breakup, and still do your job, then you're a pro," he said. "It was good. It was really ultimately a great experience of how people can treat you really well, and you still do your job even though you're sort of dying inside." Donovan, who is also famous for playing Marissa Cooper's dad Jimmy in hit teen drama The OC, was asked to predict what Joshua's future would have looked like. "Joshua is happily married and has an 18 year-old kid who is about to go to college," he guessed. "He's doing well. He's doing good."